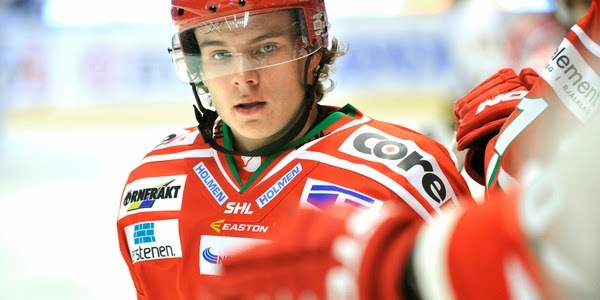 Victor Olofsson has scored nine goals this season for MODO. MODO winger Victor Olofsson and Brynas IF goaltender Jonas Johansson have been named to Sweden's preliminary roster for the 2015 IIHF World Junior Championship, which takes place December 25 - January 5 in Toronto and Montreal. The Swedes join Nikita Zadorov (RUS), J.T. Compher, Hudson Fasching (USA), Vaclav Karabacek (CZE), Sam Reinhart and Nick Baptiste (CAN) as other Sabres prospects to earn a World Junior camp invite. The 19-year-old Olofsson has put together a solid first half in the SHL, placing second on MODO with nine goals while leading all U20 players in the league with 17 points. He scored one goal in four games for Sweden at the United States National Junior Evaluation Camp in August. Johansson, who was on Sweden's roster at the 2014 World Junior tourney, looked to be atop the goaltending pecking order heading into the season. He was the leading man for Sweden at the NJEC, but a bacterial infection hindered his start to the season. He has played in just seven games all year between Brynas' SHL club and J20 entry.